As the name implies, Trojan.Lockscreen falls into the category of Trojans, so you must remove it as soon as possible. This application can definitely be called an infection, because it will enter your computer secretly and will conduct malicious activities that you will surely disapprove of. This infection has been created not for the sake of damaging your computer, but to make money off you. Obviously, you should never trust cyber criminals and pay them, because you can never know if they will keep their word and restore your computer to working order. In some cases users get duped, they pay up, but the Trojan stays intact. So if you want to prevent this, you must remove Trojan.Lockscreen. It is difficult to determine how Trojan.Lockscreen can infect your computer. 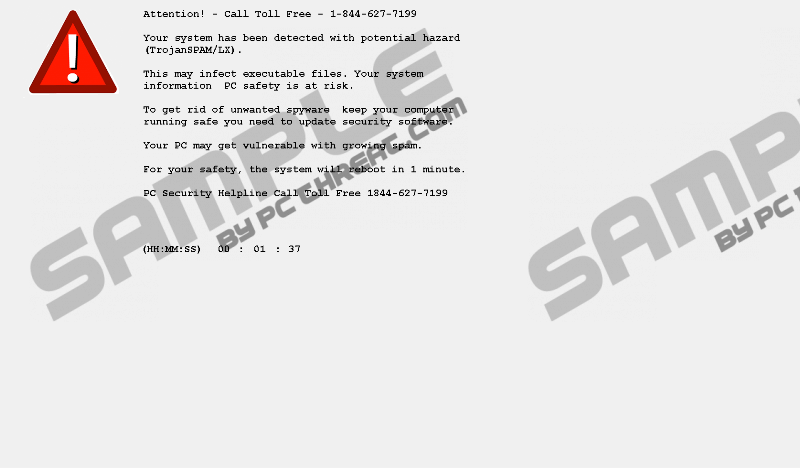 Trojans such as this one can infect your computer if you open a malicious email attachment. The Trojan will infect your computer without you even noticing it. You can also get it if you like to download pirated software, game cracks and so on. It is for this reason that you should avoid unreliable websites altogether. As far as email spam goes, the only way you can protect your computer is to get an antimalware program, such as SpyHunter that would stop Trojan.Lockscreen dead in its tracks. As mentioned earlier, Trojan.Lockscreen main task is to make money for cyber criminals. If your computer becomes infected with this Trojan, it will start displaying a full-screen message which will state that your computer is infected with TrojanSPAM/LX and that it is in grave danger. The message also says that you need to update your security software, but you need to call a toll free number to do so. We warn you not to be so gullible, do not believe anything that the message states. At any rate, this Trojan will lock your computer’s screen, prevent you from accessing the Task manager, and will restart your PC every 2 minutes. The good news is that the time counter does not work in safe mode, so you have an opportunity to remove Trojan.Lockscreen manually. It goes without saying that Trojan.Lockscreen is one malicious application that aims to trick you into paying its owners ransom. You can avoid doing this by booting up your computer in safe mode and removing it manually. Once you are in safe mode you can open the Task manager and terminate a process called combat.exe*32. After that you can go to C:\Program Files (x86)\Combat and delete the entire folder. Of course, we are going to provide you with a detailed removal guide that will take into account the differences between Windows operating systems. If the process is too difficult or impossible to complete, then you should try downloading our recommended anti-malware scanner SpyHunter, which can be installed after booting up in safe mode with networking. We hope that the information we have provided is sufficient and you are now ready to tackle this infection. On the Advanced Boot Options screen, use the arrow keys to highlight the Safe Mode with Networking, and then press Enter. Log on to your computer. Right-click on the Taskbar and start Task manager. Go to processes and locate combat.exe*32. Right-click combat.exe*32 and click End Process Tree. Then, go to C:\Program Files (x86). Locate the folder named Combat, right-click on it, and click delete. Boot up your computer in Safe Mode with Networking using the instructions provided above. Once downloaded, install the program and launch it. Quick & tested solution for Trojan.Lockscreen removal.